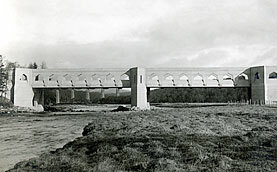 This reinforced concrete bridge is considered by some to have been the most successful collaboration between Williams and the architect, Maxwell Ayrton. It was built as part of the British government's Ministry of Transport redevelopment of the A9 route from Perth to Inverness in northern Scotland. The bridge spans a 60m wide valley, where the River Findhorn runs some 9m deep. This is achieved using two pairs of in situ concrete viereendiel-type beams, 30m, joined at a central pier. The beams are set 9.1m apart, with the cast concrete deck forming the bottom of this "box", the parapet walls forming its sides. These walls are arcaded in such a way as to emphasise the underlying structure — splayed, semi-octagonal apertures rising 2.7m from the deck at 2.9m intervals, so that the verticals correspond with slightly bowed transverse beams that support the road deck from below. Pointed cutwaters and abutment walls rise to the same level as the parapet walls, forming refuges with rectangular spy-holes. The bridge is provided with three smaller flood arches in the approach embankment, giving the massive structure a more graceful appearance from a distance. The bridge is thought to have replaced an 1833 bridge by Thomas Telford (1757-1834). Some accounts claim that there was an interim structure across the Findhorn at this spot, before the Williams' bridge replaced Telford's.